A film that’s been admired, hated and puzzled-over in fairly equal amounts, writer/director David Lynch’s ambitious 1984 adaptation of Frank Herbert’s science fiction novel gets an extensive fanediting treatment in Dune The Alternative Edition Redux. This is my third and final cut of an edit I first released in 2008 and again in 2009. As previously, it draws on the heavily cut Theatrical Version, the controversial Extended “TV” Version and a selection of Deleted Scenes and soundtrack cues. The Redux cut is, firstly, an opportunity for me to apply the additional skills I’ve learnt since this fanedit’s original release. Technical improvements include cleaning up dirty footage and completing the blue eyes FX, while creative changes include two new “filmbooks”, a new 4-part structure to the film, and a new ending that’s truer to the remarkable world that Frank Herbert created. Secondly, Redux has allowed me to respond to some of the criticisms made by fans over the years and make further changes that I think improve the storytelling and presentation. The restoration of Princess Irulan as the film’s narrator is one such example. For me it’s been a long, exciting and sometimes exhausting journey. I’d particularly like to thank the fanediting community. Without such avenues to promote my work and without the generous input and feedback of enthusiastic members, the Dune movie as I have moulded it simply wouldn’t exist. David Lynch himself refuses to revisit the film, despite admitting that “there’s something wrong with that movie” and complaining that he never had final cut. So it’s left to us fans to tinker and reshape this curious piece of sc-fi cinema; trying to minimise its many flaws, amplify its many strengths and – in my case – trying to add something new as well. The DVD9 comes with menus and the fanedit's trailer. The DVD9 release has customised English & Spanish subtitles. For the MP4 and AVI releases, the subtitles are available at Subscene.com. Thankyou to DwightFry for the Spanish translation. 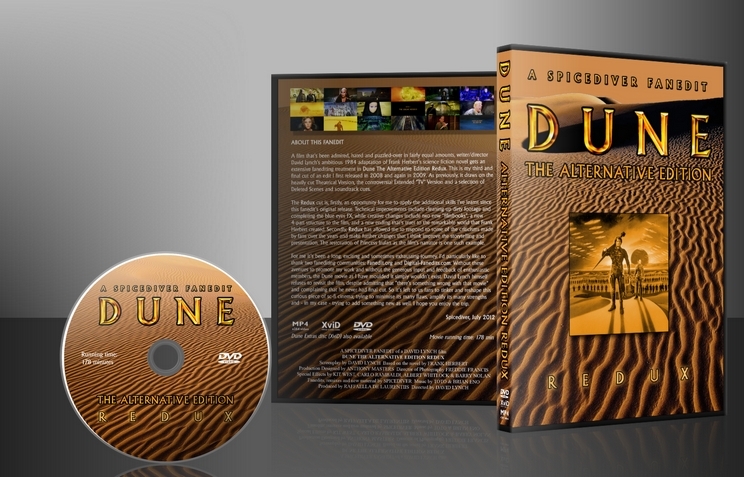 Following is a comprehensive list of changes based on the two officially released versions of DUNE – the Theatrical Edition and the Extended Edition. * Most scenes and footage unique to the Extended Edition have been used. - Paul taking Princess Irulan as his wife. * The film has been divided into four “Books”, each with a title frame preceded by a quote from various Dune novels. The original novel by Frank Herbert was divided into 3 books. This fanedit includes these and adds a 4th book to accommodate the structure of the film. The titles are: Book I: The Great Houses; Book II: Dune; Book III: Muad’dib; Book IV: The Prophet. * Two new filmbooks have been created about the history of the universe, and are seen being read by Paul Atreides during the film. They have been built with material from the Extended Edition’s prologue and are designed to match the look and feel of the existing filmbook that appears early in the movie. * Some scenes from both the Theatrical and Extended Editions have been moved around and relocated to improve the narrative, including changes to accommodate the fanedit’s new 4-part structure. * A new opening features Princess Irulan’s narration, a Fremen ceremony and customised Dune Titles. The Fremen ceremony audio now has the intended reverb added, and the chanted answers to the Reverend Mother are now the sound of a whole crowd responding instead of a single placemarker voice. * A new, simpler ending has been created, modelled on an earlier draft script, where Paul does not magically make rain fall on Arrakis. The idea of rain on Arrakis is a narrative and ecological absurdity in the world that Frank Herbert created. * Princess Irulan is the narrator. The Alternative Edition Redux uses most elements of her narration from the Theatrical Edition, plus selected audio edits from her Deleted Scene. * The male narrator including the painted prologue from the Extended Edition has been deleted, but parts of it have been reworked into two new filmbooks about the history of the universe, read by Paul Atreides during the film. * The overuse and/or inappropriate choice of music in some scenes from the Extended Edition has been addressed. * The attack on House Atreides by the Harkonnen and the Emperor’s forces is confusingly shot and edited in places. This has now been re-edited and some shots flipped around, to a give better sense of direction and a better sense of the ebb and flow of battle. * Because the Fremen Reverend Mother’s prophecy now opens the film, it’s appearance in the official versions of the Dune – when House Atreides lands on Arrakis – now seems like an exact repeat of an earlier shot. So the Trip To Arrakis sequence has now been remixed so that only desert landscapes are used for the visuals, while the prophecy is still heard on the soundtrack. * The Deleted Scene where Thufir speaks to Leto about the Fremen prophecy now opens with an atmospheric long shot of Arakeen and the castle keep. This shot has been changed to make it set at dusk and the 2nd moon rising over the shield wall has been added. * An new closeup of Princess Irulan – and some altered footage – has been included in the scene where Paul surveys the prisoners after his defeat of the Emperor. * Approximately 60% of internal dialogue has been removed from the audio track and, where necessary, the video has been recut. I believe it was a colossal mistake by Lynch to adapt this narrative device so literally from Frank Herbert’s novel. In the translation from book to film many viewers find a good deal of it irritating and unnecessary. It often spoonfeeds obvious information to the audience and can pull the viewer out of the scene rather than drawing them in. Essential elements like The Litany Against Fear have been left intact. * Deleted the incongruous St Francis Prayer section from Princess Irulan’s final narration, in order to move the story away from a simplistic and forced happy ending: “Where there was war, Muad’dib would bring peace; where there was hatred Muad’dib would bring love.” Dune is not Disney, despite producer Dino De Laurentiis’ apparent attempts to make it so. * Reduced Paul’s awkward forced laughter in two shots to a more believable smile. * Deleted some cheesy closeups of the actors when riding the sandworms. * Deleted Beast Rabban’s diabolical laughter when the Baron hands him charge of Arrakis. Also deleted the shot of him kicking over the dwarf. These villains are already cartoonish enough. * Deleted or fixed some bad rear projection FX shots during Paul and Jessica’s pursuit by the sandworm. This action scene as also been tightened to increase the sense of danger. * The climax of Paul and Feyd’s knife fight has been tightened to make it more tense and more plausible. * Completed the blue spice eyes FX on human characters where this effect was missing in the Extended Edition and in some Deleted Scenes. * Also added blue spice eyes FX to the 3rd stage Guild navigators in two scenes, in line with the description of the navigators in Frank Herbert’s books. * Colour-corrected all footage unique to the Extended Edition to remove a pronounced green tint. * Fixed the filmbook read by Paul in the opening scene on Caladan because many images are stretched out in the wrong aspect ratio. These shots have now been corrected and the images rebuilt. * Fixed the infamous editing mistakes, bad audio joins and censorship in scenes that were used from the Extended Edition. * Digitally cleaned and restored the lower resolution Deleted Scenes to improve the image quality. Also cleaned up audio where possible. * The Extended Edition DVD print is slightly crisper and generally in better shape than the Theatrical DVD print. So where Theatrical Edition footage was needed or preferred, footage from the French Bluray was used (scaled down to Standard Definition) due to the cleaner print. * The audio track from the Theatrical Edition is used wherever possible due to its superior quality and mix. My long, strange love/hate affair with Dune has culminated to an end point with this fanedit. I will never go back to any other conceivable version of Dune, nor will I facepalm myself in indigination over maestro David Lynch's well-intentioned but utterly misguided attempts at science-fiction dramatics. I am, now, at peace with Dune. To the completely uninitiated, you'll likely be as lost as we once were in 1984 with Dune, no matter what the edit. Dune requires love, the kind of love Lynch himself couldn't admit to honestly. He was right in saying there is something very, very wrong with the integral structure of the theatrical cut (disowned, I might add), but when you witness the parts the added up to that gruesome whole, there is no way "love" wasn't part of Lynch's drive and passion in design, in intention, and in, to degrees, execution. Some of what once caused me to bury me gulliver in me hands still exists: those voiceovers (NONE of which are necessary), the laughably muted "action scenes", which shows that while Lynch is capable of some almost-metaphysical miracles of cinema (check that new Twin Peaks - wow! ), he can't direct a basic action scene with any sense of suspense. The "weirding way" is awkward. The Baron remains one of THE most over-the-top-annoying villains of all time. Toto's guitar music and the special effects are hopelessly outdated. OK....still with me? Now let me tell you something about Dune. 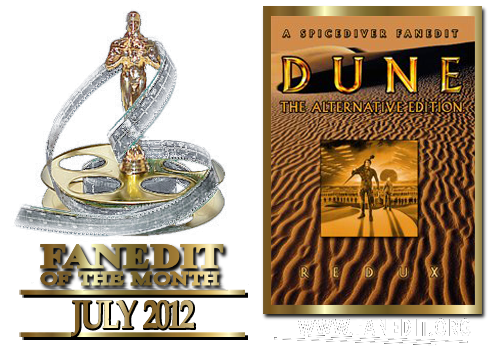 The above list and all, Dune exerts a hold, in this edit, that has a seductive power that the best science fiction stories do. It's a real epic story; it's believable. You must see Dune more than a couple times to 'get it' (I'm speaking to those unfamiliar with Herbert's work). This edit provides, finally, the pillow and framework for such a journey. At three hours, one may find spending that kind of time with....DUNE....utterly insane. For me, the first time with this cut was like Christmas morning - let me settle in, let me explore, let me be carried away on those titles: "BOOK 1", "BOOK 2", etc. It adds grandeur, love, and the kind of correct structuring and framework this story needs, freed from all pretenses of "profit" and "box office". It ain't Jodoworsky, but Lynch deserves to be proud over what he envisioned. Spicediver brings out the absolute best in Dune. By the time the transcendent vision of the Atreides fleet folding space to get to Arrakis comes to the screen, we are dealing in sci-fi territory not to be reckoned with. Sure, Dune screams for a remake (Denis Villeneuve, where are you??? ), but the lengths Lynch went to, following his walking away from the Return of the Jedi job, are nothing less than astonishing. As a big Grateful Dead fan, i remember an interview with Jerry Garcia, where he says that he was pushing the band to get to a place he had once been to and found it ever-elusive. And thus it was forever. He was very, very frustrated in not being able to "get there", but then listened to the tapes of the band's gruelingly intense live improvisational work and was amazed at what was created in the process. You could look at Dune that way - a vision that ultimately fell short of complete realization, but, wow, what a way to fail! This is a psychedelic movie. It is a tale of a society which has evolved itself around a drug. The vision you need with Dune is with an inner sense of the infinite related to narrative, to believe in the "realism" of such a society. It certainly is a vision of realistic proportions. Again, Spicediver pays very close attention to that sense of the psycho-tropic infinite, and, with that pallet, we willingly let ourselves be carried along towards Paul's sense of self-actualization on Arrakis, blue-eyed wonder. The 8/10 section of my review is due to the limitations in quality of the deleted scenes - it's more than obvious when they're in the film. But, having seen the edit as many times as I now have, they have become seamless. So fine-tune your truthsayer senses, turn off all the lights, turn the volume way UP, and behold Spicediver's miraculous salvaging of Lynch's tottering giant. Spicediver, you have done something truly remarkable - through the film you have ended the problems of Dune. The best fan edit that I've ever seen thus far without making it such an enterprise like Adywan's Star Wars Revisited. - Much more comprehensive to those who find Dune complicated to understand. - Very coherent narrative with well placed explanations either by Irulan, the male narrator or by the characters own "audible thoughts". - Very good work with music mixture and sounds. - Good visual treatment, added blue eyes to the 3rd stage navigator, Fremen and other characters, etc. My personal praise to SpiceDiver and whomever may have contributed to this edit. I've seen it before but at the time i didn't wrote my review because i didn't had the sufficient knowledge to do so and even today i'm continuously learning more about this wonderful universe. PS: i saw the DVD9 version, i don't know if I've chosen the correct classification. Better story development than any other version. Unfortunately some footage has quite bad picture quality, but the improved narrative justifies including it. Thank you for this tremendous effort. Thank you spicediver for finally giving us a great version of this movie. It was a great idea to break the movie into four 'books'. This version is so much more cohesive and flows from scene to scene much better than anything that has been presented thus far. There are a couple of hiccups but nothing that detracts from the overall experience. I use the word experience because watching any David Lynch movie is an experience more than anything else. Even though this is one of his more straightforward movies it still has some moments of oddness and very unique imagery that can only be associated with Lynch. This will definitely be my go-to version from now on. It's just so much better than the other cuts. 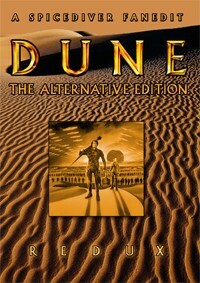 If you are a fan of Dune, or just curious, start with this version and forget about the rest. You won't need any other version. Well done and thank you again spicediver. THIS IS IT. This is the edit that made me realize how much a talented, imaginative and passionate individual can change/improve/transform a movie. This is the edit that made me write my first review. I have seen other edits. Good edits that add some scenes, remove some scenes, improve the pace, the narrative etc. But nothing had prepared me for this. This is an unbelievable achievement and my go-to edit to prove to other people the power of fan edits. I first watched Dune as a kid in the late 80s/early90s. I was mesmerized by the visuals, but didn't understand s**t. Then I watched it again after reading the book and didn't like many parts of the movie. The pacing was bad, the script at places was bad, uneven... but certain aspects like the art direction impressed me, and I found Lynch's vision and atmosphere very fitting... when it worked. Then came the extended edition. It added many interesting deleted scenes, but the overall result was of bad quality. The storybook intro was amateurish and the added scenes were just thrown in there without even some added effects. The Third stage edition fanedit managed to vastly improve the above extended edition and it was my definite version... up until spicediver did his magic. The change in the pace is phenomenal. The Book-Chapter separation works really good and many scenes have been very cleverly altered to fit the mood. The removal of most of the inner voiced dialog improves the movie immensely. Technically this edit is perfect in my eyes and considering the some of radical changes, this is a huge achievement. The fact that this fanedit includes English subtitles is another big plus. I wish more faneditors did this. Even if I consider myself pretty fluent in English, I usually choose to watch movies with English subtitles because they help me a lot, especially with strange accents and/or low voices. Faneditors should have in mind that non-native English speakers always welcome English subtitles. Anyway, this fanedit is a testament of talent and love to the franchise as a whole. This edit transformed an interesting but deeply flawed gem into a brilliant movie. Thank you.